The Chuckwalla Trail is a very family friendly trail with a lot of rocks to climb, trails to choose from and great picture opportunities. 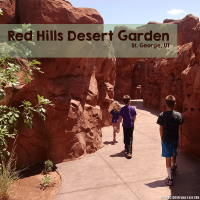 This trail is also ideal for families because it is so close to the city of St. George, UT and residential areas. This makes it the perfect escape for a quick release of energy without having to pack for an entire day trip. 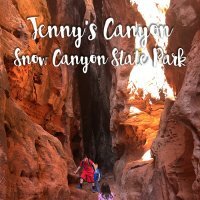 This trail is technically part of Snow Canyon State Park, but it is bonus favorite because it’s entrances lay outside the park. This means it is FEE-FREE! 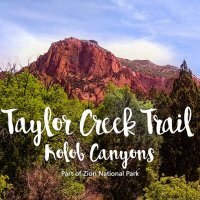 The trailhead is found on north Bluff Street, just past Snow Canyon Parkway (when driving north on Bluff, out of St. George city). Bluff Street, also called State Route 18, continues north past the turn off to Santa Clara and Valley View (you will continue going straight, don’t turn left). Stay to the right as the road splits; left to Snow Canyon Parkway, straight to Chuckwalla. After you pass the turn off to Snow Canyon Parkway, you will see the trailhead on the left hand side of the road. It is also found easily on Google Maps (see below; click to enlarge). There is ample parking in a packed dirt parking lot. Plenty of room for horse trailers and lots of vehicles. There are also bathrooms in the parking lot. You can begin the trail in either parking lot (there are two areas). The trailheads are clearly marked and easy to find. At the beginning of the trail are clearly marked maps. One of the things we love about this trail is you can do a short hike, or extend it, based on your ability and time. The Chuckwalla Trailhead and climbing area is the start of quite a few different trails. Check out the map before you head out. As you begin the trail, you will see the designated climbing area. 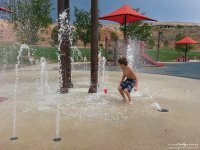 This is a favorite for locals; so easily accessed from town and lots of room for everyone to enjoy. If you aren’t there to climb, keep following the trail down the hill. I would not recommend a stroller on this trail. Some jogging strollers may be able to manage the rocky terrain, but I still would not recommend this. However, it is easy enough for little ones to manage on their own two feet. My kids loved this simple trail because it had so many places for them to climb and explore. (Note: Be cautious and do not allow your children too far off the trail. We only allowed them to climb on rocks and areas right next to the trail. The reserve does ask you to remain on the designated trails to help maintain critical habitats and vegetation growth.) If you plan on sticking to the Chuckwalla Trail alone, it is a short .9 mile trek. Feel free to spend some time allowing the children to run and play. This is even a fun and easy trail to let the older kids run ahead without worry. At the end of the “official” Chuckwalla Trail, there will be fork. You can choose a new trail. Chuckwalla will turn in to Beck Hill, or you can head left to North Crossing. We took the short walk up North Crossing to see the arch. It is just a little bit further but another fun place to take some time to play. Does have “wash” areas; be cautions hiking during storms. Avoid during flash flood warnings. Could be muddy after rainstorms. 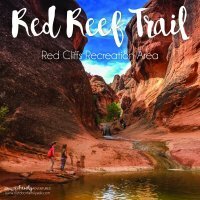 Click here for trail information on the Red Cliffs Desert Reserve website. We are also in the middle of putting together a fun little scavenger hunt for this quick easy trail. Check back for more info!